WATCH What is a meteor shower? 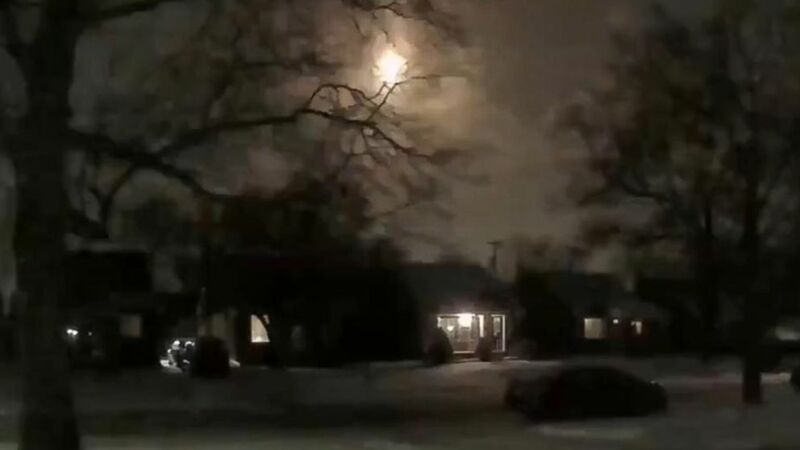 The meteor that lit up the night sky over southeast Michigan and shook the ground Tuesday night did not actually cause an earthquake, researchers say. In fact, meteors do not cause earthquakes to rupture along a fault, according to William Yeck, a research geophysicist at the United States Geological Survey's National Earthquake Information Center in Golden, Colorado. The seismic observations associated with the meteor were assigned a magnitude 2.0 by the United States Geological Survey, which said the event was centered about 5 miles west-southwest of New Haven, Michigan, some 40 miles northeast of Detroit. The National Weather Service sent out a tweet that said, "USGS confirms meteor occurred around 810 pm, causing a magnitude 2.0 earthquake." But Yeck said the magnitude cannot be directly used to compare the meteor's size to an earthquake because the source of the seismic signals are different. "While the event was reported as a magnitude 2, the magnitude scale is used to estimate the size of earthquakes and therefore is not an accurate representation of the observations from a meteor," Yeck told ABC News. Researchers are still investigating this specific incident, Yeck said. The seismic waves observed from these events are typically not from an impact but instead are sound waves generated in the atmosphere. Image taken from video, Jan. 16, 2018, showing the meteor that the National Weather Service tweeted "USGS confirms meteor occurred around 810 pm, causing a magnitude 2.0 earthquake." Bill Cooke, the lead of NASA's Meteoroid Environment Office at the Marshall Space Flight Center in Huntsville, Alabama, said Tuesday night's phenomenon occurred when a meteor, measuring about 2 yards in diameter and traveling at about 28,000 mph, entered the Earth's atmosphere over Michigan. The pressure difference between the air in front of the meteor and the air behind it caused the rock to break apart and explode in the sky with the force of less than 100 tonnes of TNT, Cooke said. That explosion generated shock waves that traveled down to the ground northeast of Detroit, where residents heard a loud boom and felt the ground beneath them tremble. The meteor would not have landed intact, Cooke said, but rather tiny pieces weighing only a few ounces would have scattered over the area. And it's not a rare event. "It's common with fireballs that produce meteorites on the ground," Cooke said. "When the shock waves hit the ground, it will shake the ground a bit." Still, the explosive flash, the sonic boom and the ensuing vibrations on the ground both dazzled and startled residents. "That's probably a little bit disconcerting," Cooke said. Although meteorites have damaged cars and the roofs of homes, Cooke said no one has been killed by a meteorite in recorded history. "I would say most folks are pretty safe," he said.